Precision Metal Industries ISO 9001:2008 Quality Management System exceeds the requirements specified in ISO 9001 and is the ULTIMATE in any commercial or military requirement. Our procedures are continuously reviewed, audited and re-written to provide performance within the system, making us World Class. Our Quality is #1 as a direct reflection of our continuously improved Quality Management System and process performance enhancements. 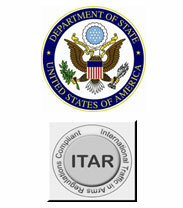 All manufacturers, exporters, and brokers of defense articles, related technical data and defense services as defined on the United States Munitions List (Part 121 of the ITAR)(PDF, 7MB) are required to register with the Directorate of Defense Trade Controls (DDTC). Registration is primarily a means to provide the U.S. Government with necessary information on who is involved in certain manufacturing, exporting and brokering activities. Registration does not confer any export rights or privileges, but is a precondition for the issuance of any license or other approval for export. SAM (System for Award Management) now collects, validates, stores, and disseminates data in support of agency acquisition missions, including federal agency contract and assistance awards. Central Contractor Registration (CCR) is the primary registrant database for the U.S. federal government. CCR collects, validates, stores, and disseminates data in support of agency acquisition missions, including federal agency contract and assistance awards. Online Representations and Certification Application (ORCA) is an e-Government initiative that was designed by the Integrated Acquisition Environment to replace the paper based Representations and Certifications process. Precision Metal Industries, Inc. holds verified certification with the U.S./Canada Joint Certification Office, DLA Logistics Information service.